By LUDWIG VON KOOPA - Have a great Squidmas! It's important we call it that. NGYES! It's the night before Squidmas! It's the best day of the year. If you think us squids celebrate and party hard during Splatfests (and I hear Ludwig the Koopa keeps writing articles about that), you haven't seen anything yet for Squidmas. So Squidwig is here to tell the great readers of KoopaTV (and you guys really are great people in accepting me as one of you) of a problem. Because it wouldn't be a KoopaTV article without a problem, right? 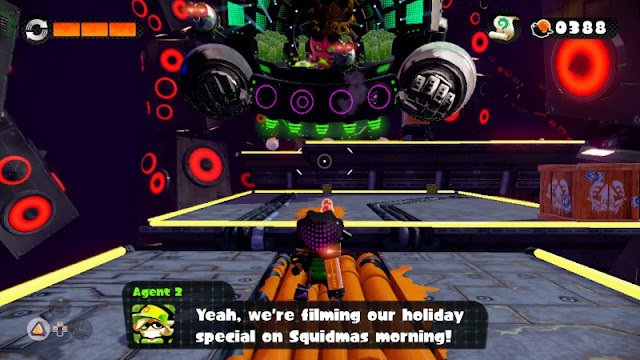 What could possibly be problematic about the awesome holiday of Squidmas? Squidmas is almost here! Like, tomorrow! There's a war on Squidmas. Kids these days are more concerned about splatting one another than celebrating the holiday, which is supposed to be about peace and love. To the point that people are butchering the name to be "Splatmas"?! "Merry Inkmas Eve, my friendly squids!"??? That's trying to have it both ways. It's directed towards squids! Thanks! But what is "Inkmas"? It's not about ink. Ink isn't even unique to Inklings, despite what the name might indicate. In fact, our mortal enemies use ink as well. But it misses the point even more than before. Even more creatures can swim than can use ink. We're straying extremely far from the spirit of Squidmas. It's not just Callie failing Father Squidmas. It's a whole society of lost squids. Who I'd say are much more like kids. It's a holiday about the family, too. And the good Inklings get great presents, while bad ones get coral. I think anyone who doesn't fully respect Squidmas should get that coral. We gotta come together on this. See? Visiting your family is an important part, and Father Squidmas is figuratively in everyone's family. So that's why we'd celebrate Squidmas. Now, this guy is just talking nonsense. Squanukkah and Squanzaa? 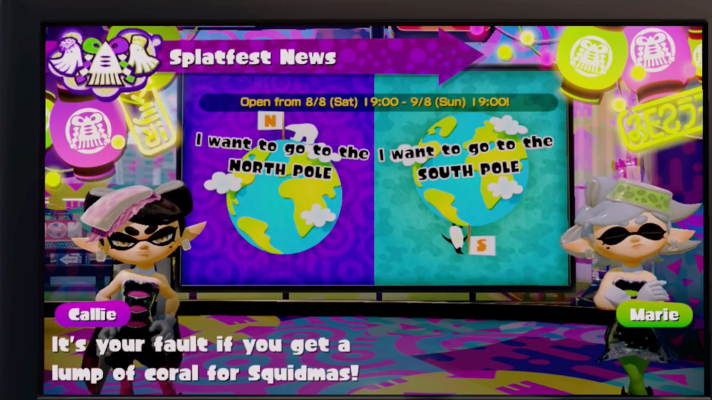 He's literally just making up fake holidays to try to dilute the purpose and practice of Squidmas. Don't listen to this guy. He's an enemy of society. Don't listen to that person either. It's actually called Squidmas. Chrismas? Who is Chris? This one doesn't even relate to anything. X-Mas? X-MAS? What the hell is an X-Mas?! You know what "X" means, and not Ludwig's weird attempt to figure out what the "NX" means? "X" means it's a placeholder variable, because you don't know the value of what actually goes there. This person who is saying "Merry X-MAS", with their weird grin and all, is basically saying, "We don't actually know what goes before 'mas' so let's put an X here." Is this a deliberate water-washing of Squidmas and what it stands for? Maybe this Inkling genuinely doesn't know what the holiday is called because, as you've seen in this article, people keep referring to it by different things. Words matter. There is this cumulative obfuscation that is seriously affecting Inkling culture now. What used to be a revered holiday is now being lost among the people. Look to heroes Agents 1 and 2. They won't even show up to the family-visiting part. "Hey, um, Gramps? I don't think I can make Squidmas this year." "Yeah, we're filming our holiday special on Squidmas morning!" Well, we'll see this morning what will happen with that. But working on Squidmas? Squids shouldn't do that. Leave that to those others. To the rest of you, and your families: Have a fantastic Squidmas! And don't forget where you came from. Squidwig is KoopaTV's Inkling correspondent. Ludwig noticed there's a Turf War on Squidmas on his Miiverse account, and asked Squidwig for a report. Ludwig himself noted in the Naughty vs. Nice write-up that there is a certain element of society that's going against Squidmas. The last time Squidwig gave a report was on the history of how the Environmental Protection Agency gave the world of toxic water to begin with. 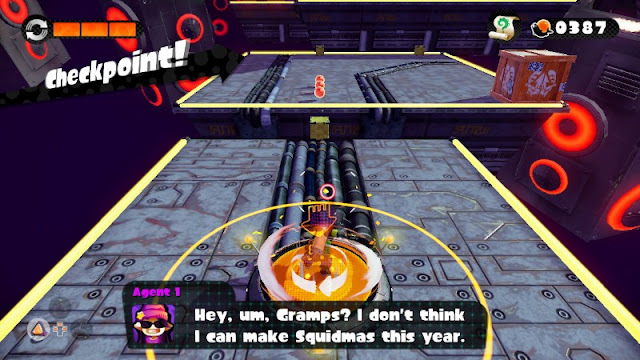 Squidwig finally makes another appearance in 2018, as the Octarians have fully moved on their plan to take over Inkopolis. There is a war on Squidmas, and now a war on Squidoween. 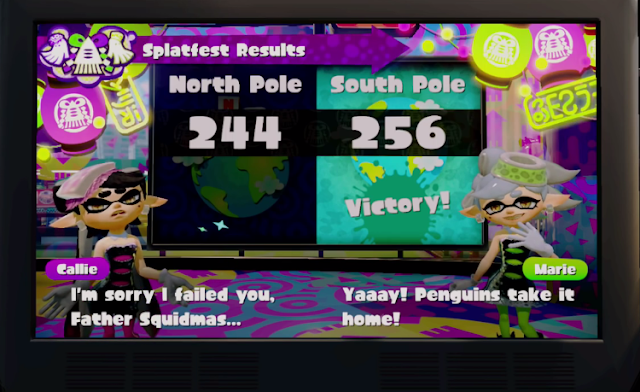 Squidmas seems to have won the war. I hope you accept that I celebrate Octannukah but I am respectful of all species' holidays (I celebrate Hannukah in real life, in case it was not clear). All us species can leave in peace and harmony and I am not one of those who try to attack Squidmas. As long as you don't try to attack the sanctity of Squidmas, then you're free to celebrate whatever you want. I mean, you'd be free either way, but at least you wouldn't be a subversive jerk. Marie used to like Marshmallows in the NA translation. She had the dialogue that she ate them all in the original Camp Triggerfish text which was then changed after Marshmallows vs Hotdogs. She still likes them in Europe. Callie is afraid of heights in Japan and Europe but not in NA (well there is that one Agent 1 dialogue that says she is afraid of heights) probably because then people would be questioning why she supported roller coasters but it is possible for an acrophobic to ride roller coasters as it really depends on what aspect of heights they are afraid of. If someone feels alright with heights as long as they feel secure enough then they are okay with being passengers on planes or riding roller coasters. It's if they feel they may fall off that will freak them out such as having flimsy guardrails be the only barrier between life and death when hiking on a cliff. Then again NoE, NoA and even NoJ has Callie wanting to ride a helicopter so that should tell you the type of acrophobia she has in Japan and Europe's translation. Callie questioned why she was on Naughty's side in NA so it's not like NoA tried to ignore the discrepancy. 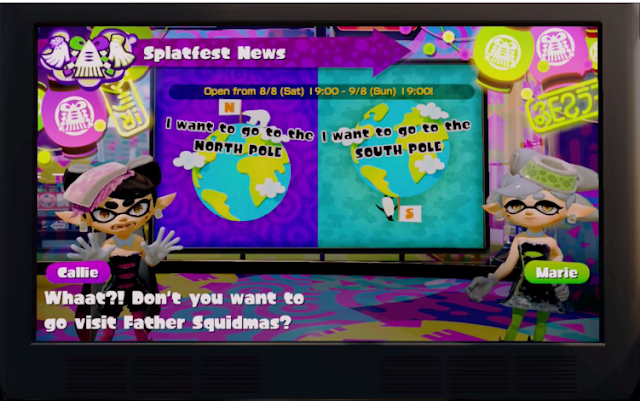 According to what the hacker found out it seems Callie and Marie switched roles for this Splatfest. If Callie lost that Splatfest she would be the salty one that time rather than the usual "oh well, better luck next time" when she loses. I didn't even think about the whole heights thing for why I'm afraid of rollercoasters. It's more like "I'm scared of moving that fast" (I'm scared of highways too) and I definitely wouldn't feel secure on a rollercoaster. Or a hike. And as I pointed out, Callie never got an answer! I guess I was intimidated about the backlog this site has so I either see interesting topics randomly or I search different terms to see what you have to say on the subject. I mean I only found out about this site relatively recently with a chance encounter at a SSB Wii U Team Battles match when I had the name tag "KidOrSquid" and you added me so I can see the name of the website in your SSB4 profile. I have a Master's in both Psychology and Social Work which explains why I understand a bit about phobias. Yeah our backlog is pretty scary. I wonder if there's anything I can do about that...! (However, I usally forget to look at profiles on the results screen so it was a good thing it was done anyway. not a creature was stirring, not even a octopus. in hopes that St. Squicholas soon would be there. while visions of turf wars waged in their heads. had just settled our brains for a long Splatfest nap. I jumped to the base to see what was the matter. I heard him exclaim, "Happy Squidmas to all, and to all a good night!" You've done well for yourself today. Thank you. 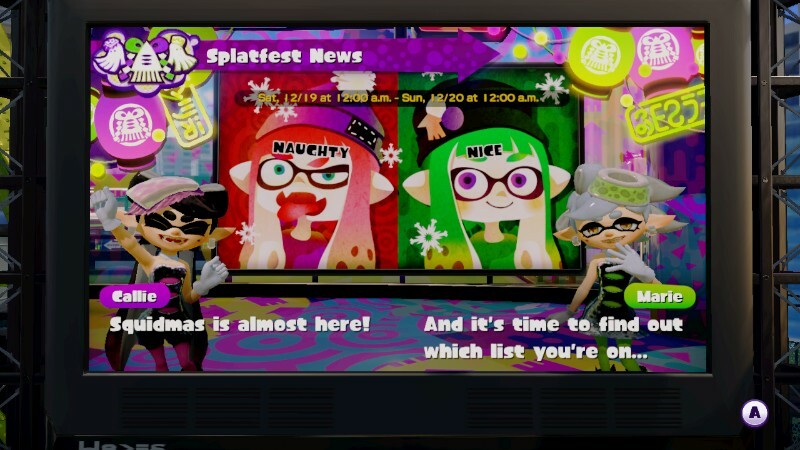 Indeed, and a very Merry Squidmas to you, too!